Christmas music | Cue Castanets! Ok, here it goes. By now, I think I’ll have to face the fact that my blogging will never again pick up the pace it had when I started Cue Castanets in 2014. Then and in the following two years I was able to write a lot of posts on a variety of Wall of Sound-related subjects as well as interview a number of interesting people for the blog. Since making a career move to a different type of job a few years ago I’ve sadly had significantly less time to devote to blogging. As of writing this, it’s been more than a year since my last entry on the blog, and we’ll see if I ever get around to write more here again. I hope so but I can’t promise anything. For the time being though, the reason why I’ve turned on the lights again at the Cue Castanets headquarters, however shortly, is a new Christmas single I discovered yesterday,… and one that I felt I just had to write about here. Those who’ve followed the blog know that I’ve usually highlighted a few modern Spector Christmas sound-alikes every December and I’ve been on the look-out again this year. But it wasn’t until yesterday that anything had me interested, and that’s when I heard ‘Next Year will be Mine’ by indie-psych-popsters Whyte Horses. Their Christmas single came out yesterday and it’s a great track! It’s always nice to hear a faithful and loving imitation of the wall of sound – especially so when the topic at hand is Christmassy. There’s just something about Christmas and the wall of sound that go hand in hand and have done so ever since Spector issued his Christmas album in 1963. The Whyte Horses release has just the right sound although some Nitszchean strings throughout would have been icing on the cake. Oh well, can’t have it all, I guess – and ‘Next Year will be Mine’ will definitely make my Christmas playlist for years to come. I really like it and its accompanying faux-70s/ABBAesque video. Dig this lovely dose of yuletide Spector-worship and have a merry Christmas & a happy new year! It’s been a while since I’ve featured some of the modern Spector soundalikes I have a habit of tracking down just for the fun of it. There are literally thousands of newly produced songs out there leaning heavily towards a Wall of Sound-type approach, ripe for picking for any obsessed Spector fan. Christmas-time is often especially rewarding because of the fact that Spector’s iconic ‘A Christmas Gift for You’ album has virtually brainwashed everyone into thinking that the Wall of Sound is the sound of Christmas; a warm, enveloping and nostalgic sound that artists today often go for when recording Christmas music, probably even without giving it much thought. Glockenspiels, strumming guitars, church bells and a ‘Be my Baby’ beat. Why, that’s just what Christmas sounds like, isn’t it? So today, this latest installment of the Modern Spector Soundalikes feature will present a festive doublesider in the form of two recent Christmas releases that both make use of some of the hallmarks of the Spector yuletide sound. I don’t know much about the artists other than that the duo Ette hail from Scotland while Mr Little Jeans is one-girl project from Norway. No matter, these two songs should appeal to everyone checking in from time to time. Both productions are a little on the crude side – no sweeping Nitszchean strings here or a thousand acoustic guitars strumming in unison in a sea of echo. But both singles are still very, very enjoyable with sweet female vocals and a very classic song structure that make the songs seem familiar and inviting even on first listen. Surely, these songs wouldn’t have been out of place on an imaginary Philles Christmas single by the Ronettes, the Crystals or Darlene Love. Check them out. I dig the huskiness and Scottish accent of the Ette singer and really, really love the dreamy chorus on Mr Little Jeans’ ‘Dear Santa’. Great stuff! Hope you’ll enjoy these two releases as much as I do. Aaaah. The familiar sound of Spector’s yuletide classic has emanated at my home today,.. and as you can see by way of the PSI reissue in stereo. I almost prefer this version over the regular mono version. I wish I could find an online video of ‘White December’ by Kylie Minougue off her new Christmas album because this nice track falls into the former category of new Christmas songs that try to mirror Spector’s grandiose take on the Holiday season. No video on youtube yet but give it a listen via Spotify, Amazon or other sites online. It’s a keeper! In terms of the latter category – songs that don’t appear to be ‘Spector does Christmas’ homages at first listen – I’ll throw in a new song by Peter Andre into the pile. Peter Andre? The guy who had that cheesy ‘white guy sings reggae’ hit ‘Mysterious Girl’ in the late 90s? Yep. That guy. Never thought I’d actually like something from him, but I have to admit that this one is pretty good, – and has enough saxophone and retro flourishes in the mix for me to lump it together with other Christmas songs of recent that aren’t too far removed from the sound on the Spector Christmas album. If you have any recommendations of new Christmas songs you’ve discovered that might interest me and those who follow the blog, then please,… bring them to the table via the comment section to this post. 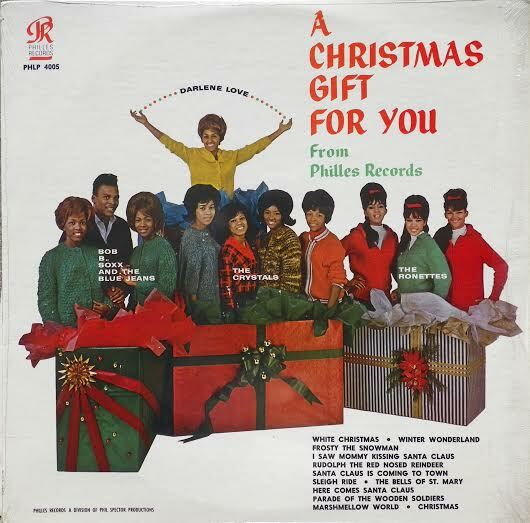 Come Monday, December the 1st, you’ll be spinnin’ Phil Spector’s ‘Christmas Gift for You’ longplayer 24/7,…. That is, if you haven’t done so already through 2014? It’s that good an album. Yes, Phil Spector really outdid himself when he loomed large over sweating Wrecking Crew members in Gold Star studios during long, hot summer nights in 1963. End result? The perfect Christmas record. It will probably never be outdone when it comes to bringing holiday cheer. For someone as notoriously known for padding out albums with quickly recorded filler, Spector uncharacteristically kept his focus while working up ‘A Christmas Gift for You.’ All the songs are great and sure enough; the one original song on there, Darlene Love’s ‘Christmas (Baby Please Come Home)’, has rightly so become one of the ultimate holiday anthems. ‘A Christmas Gift for You.’ The cover art is legendary! Even though the album didn’t see much success upon its original release, no doubt affected by the JFK assasination shortly after it hit the streets, it has since grown in stature. Nowadays, it wouldn’t be wrong to call it the ‘Pet Sounds’ of Christmas music. Year after year it tops the lists of Christmas albums when music critics, blogs or websites offer their opinion of the greatest Christmas music of all time. Spector’s Wall of Sound and the Christmas spirit definitely was a match made in heaven. 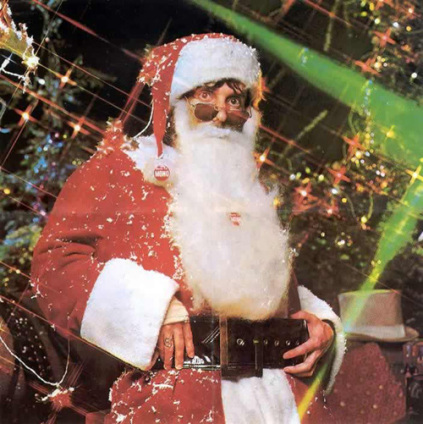 A lot of the elements that made his sound work fit the yuletide feeling to a T. We’re talking sleigh bells, sweeping string arrangements and a warm, muddled sound. It’s no wonder that time has proven Spector’s album to be the perfect soundtrack for huddling up in front of the fire while it’s snowing outside. You could say then that the Wall of Sound has become synonymous with Christmas because of the album. And not surprisingly, December is the time of year where you’ll have the best chance of discovering new Spector-influenced music if you check out each year’s flood of new Christmas releases. To prove my point I’ve decided to combine my love for modern Spector soundalikes and Christmas music in this post. The goal is to compile my personal tribute to ‘A Christmas Gift for You’ using songs from modern artists who clearly show how Spector’s ghost continues to hover over a lot of today’s Christmas music. The rules are simple. All songs must be from the new millennium. All songs should be original as opposed to Spector’s album, just to keep it a bit more interesting for you, the reader. And it almost goes without saying that I must come up with 13 tracks, – the same amount as on Spector’s album. I’ve managed to find youtube clips for all songs which I’ll embed here for your listening pleasure. So bear with me & the blog if this post takes some time to upload in your browser. Ready for some Christmas Wall of Sound? Here we go! This single from 2008 is the perfect opener. It’s a stunning team-up between Swedish retro-rockers the Hives and US veteran Cyndi Lauper. Cyndi really gives Ronnie Spector a run for her money, no doubt drawing on her experience of singing back-up for Ronnie a long time ago. Here’s a nifty song I discovered last year. It’s from this British singer’s Christmas album and probably the most blatant ‘All I Want for Christmas’ rip-off you’re ever going to hear. Mariah Carey should sue any day now. But since I’ve, unbelievably so, become tired of listening to Mariah’s song, this’ll do nicely to fill the gap. Again a more recent song by Scottish indie-pop band Attic Lights. These guys are great and have proven to be perfectly adept at the Spector sound before, – check their ‘Bring You Down’ single for evidence. This is like a cross between Phil Spector’s Wall of Sound and Brian Wilson’s mid 60s work. High praise indeed but this fantastic song deserves it. Here’s the second Swedish entry. This was actually a theme song made for a local TV show which is all the more remarkable as it’s one of the best and most enjoyable Wall of Sound pastiches I’ve heard. Listen to that thumping beat and the catchy melody. Imagine how this could have sounded with Darlene Love behind the mic! Great use of castanets and a Hal Blaine-sounding drum beat on this classic track from US singer Lisa Mychols. The arrangement is majestic with perfect backing by the Wondermints who have made up the backbone of Beach Boy Brian Wilson’s band for years. The Dutch also know how to rock it out Spector-style! Another Spector fan alerted me to this great track in 2011 and I was instantly won over by their jet-propelled take on the Wall of Sound. Sleighbells galore, rapidfire piano runs and a melody that’s catchy as hell! There’s even a Steve Douglas wannabe honking away on the solo! We’re off to Sweden again for this melancholic ballad. It’s a toned down approach for sure compared to the other songs. I’ve had a soft spot for this one ever since discovering it. The use of glockenspiel, sleighbells and jangling guitars is very touching and perfectly complements the sad lyrics and soft ‘sha-dam-dam’ backing vocals. We’re back to more familiar territory with this by-the-numbers Spector tribute. This one is a no-brainer for inclusion with its percussive sax and grand sweeping string arrangement. I would have preferred a singer with a stronger, more distinctive voice but you can’t have it all, I guess. If you’re going to make a convincing Wall of Sound tribute the dream scenario would be getting Darlene Love to belt out your song. That’s what happened in 2005 when comedy show Saturday Night Live decided to do a sketch about the holiday season and Jewish people. What better way to address the topic than with a perfect Spector sound clone? My jaw hit the floor when I first heard this production. It’s note-perfect Wall of Sound and wouldn’t have been out of place on the original ‘A Christmas Gift for You’ album,…. with revised lyrics of course. Sadly, this one has never come out as a conventional track. Someone somewhere should really re-record this great song with new lyrics! Not only did Scottish band Glasvegas pay their debt to Spector’s sound with a few songs off their cool debut album in 2008; they even followed in his footsteps that same year by releasing a great Christmas mini-album. Lead singer and main songwriter James Allen has a voice to die for and really knows how to milk a song for all it’s worth. The obligatory sleigh bells and a maelstrom of churning guitars add to the intensity. I’ve written about the criminally overlooked Welsh band the School before. If they indeed went to school in Spectorland, they got straight As! And sure enough, they put their Wall of Sound skills to good use on this cracker of a Christmas single. Listen to that chorus with the background whooos. You could easily imagine the Crystals sing their hearts out on this one. The last song here is one I co-wrote and recorded with the group I’m in last year. Please don’t throw tomatoes at me! I know it’s a bit cheesy and self-serving to include your own song but a fellow Spector fan whose opinion I respect urged me to feature it on the blog as he felt it was a great tribute to the Wall of Sound. So what the hell… I do think it encapsulates what this post has been all about. We tried to put everything but the kitchen sink into this one. Mandolins, dramatic strings, glockenspiels, 6 acoustic guitars playing in unison, … you name it. So there you have it. I hope you discovered some cool songs you didn’t know before coming here. If they’ll bring you some holiday cheer throughout December my mission is accomplished. If you know of songs that would have fit here, please drop me a comment below. I’m always on the look-out for more stuff in the same vein. And if I happen to discover something similar this year I’ll of course write about it on the blog. So keep checking in.